From morning policy forums, lunch discussions, and after-hours networking events to national and international travel, the Chamber offers outstanding programming at a variety of times to fit every member's interests and availability. Register now for an upcoming event. To learn more, contact Chamber Events Coordinator, Vanessa Watson, at (919) 967-7075. 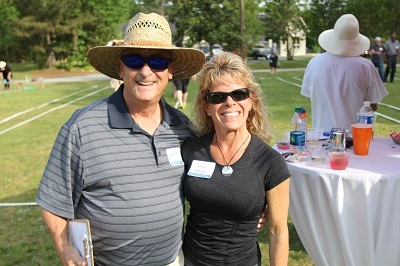 Our staff relies on volunteers to help run events, such as coordinating registration at the Chamber's Annual Meeting, judging lines at the Community Bocce Derby, and monitoring the hole-in-one competition at the Performance Golf Classic. If you are interested in volunteering with the Chamber for just one day or several days throughout throughout the year, please contact Chamber Events Coordinator, Vanessa Watson, at (919) 967-7075. Ambassadors are volunteers who build relationships with the Chamber’s newest members, facilitate networking among members, and encourage meaningful participation and involvement in Chamber programs. Ambassadors attend monthly meetings, accept new member assignments at each meeting, conduct introductory new member interviews in-person or over the phone, and maintain monthly contact – via email or phone - with their assignments for one year. To learn more, contact Chamber Chief of Staff, Justin Simmons, at (919) 357-9982. Apply Now. The Chamber has several board-appointed committees, including Membership, Finance, and the Government Affairs Committees, as well as work groups, including the Carrboro Business Alliance, Chapel Hill Young Professionals (CHYP), Taking Care of Business, and the Nonprofit Round Table. To learn more, contact Chamber Chief of Staff, Justin Simmons, at (919) 357-9982. Town and county advisory board recommendations heavily influence the decisions of local elected officials and policy makers. As such, it is imperative that the business community has representation and a voice on key committees, particularly planning and economic development-type boards. Appointment to these boards requires the completion of an application and, if appointed, a monthly time commitment. Learn more and contact Chamber Vice President for External Affairs, Katie Loovis, at (919) 696-0781 (cell) to be nominated. We are proud that many outstanding, local nonprofit organizations choose to be members of our Chamber and we encourage all local residents to get involved and volunteer. View the directory of Chamber-member nonprofit organizations. Specifically, we encourage our business members to serve on a nonprofit board. Build a Better Board is a helpful e-resource that matches Triangle area nonprofits with talented individuals who would like to serve in a vital nonprofit board role. To learn more, contact Chamber Chief of Staff, Justin Simmons, at (919) 357-9982. Leadership Chapel Hill-Carrboro is an intensive designed to inform, develop, and engage committed and emerging leaders in the greater Chapel Hill community. Participants broaden their understanding of issues and opportunities facing the region, refine their leadership skills, and are invited to deepen their influence through ongoing networking and service opportunities. This cohort-based learning experience features nine sessions over four months and helps participants better understand key issues in our region (government, education, health and human services, economic development, and the environment). For questions, contact Chamber Vice President for External Affairs, Katie Loovis, at (919) 696-0781 (cell). Learn More and Register Now. The Chamber hosts candidate forums and administers a candidate survey to help inform your vote. Make your voice heard - exercise your right to vote. Register to vote or check your registration, and learn more about your ballot and the candidates through the Chamber's Election Hub. For questions, contact Chamber Vice President for External Affairs, Katie Loovis, at (919) 696-0781 (cell). Have concerns about or ideas for our community and want to make a positive difference? Run for local elected office. There are many offices to consider, including Town Council or Board of Aldermen, School Board, Board of County Commissioners, and the list goes on. Often, local candidates run unopposed, which means we need more leaders like you to step up and give voters a choice. File for Candidacy. For questions, contact the board of elections or Chamber Vice President for External Affairs, Katie Loovis, at (919) 696-0781 (cell). 10) Nominate an outstanding organization or individual for an award. The Chamber coordinates several awards through three annual events: the Annual Meeting, the Business Excellence Awards, and Salute to Community Heroes. Awards include Citizen of the Year, Lifetime Achievement, and Business of the Year (Large, Mid-size, Micro, and New Business). To learn more and make a nomination, contact Events Coordinator, Vanessa Watson, at (919) 967-7075. If this top ten list did not satisfy your craving to engage, then please contact Chamber Chief of Staff, Justin Simmons, at (919) 357-9982. It would be his pleasure to help brainstorm with you on how we can best get you involved.